Everything must leave some kind of mark. 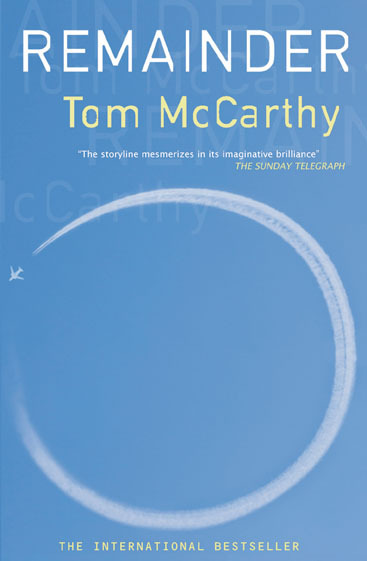 Tom McCarthy couldn’t get Remainder published in the UK at first. He eventually sold it to a French house who marketed it through art galleries rather than bookstores. It proved a critical hit and so was then picked up for a more traditional UK release. I wrote recently in the context of Elif Batuman’s article about how I feel there’s a degree of conservatism to contemporary publishing (of course there is; they’re businesses). Remainder’s difficulties are as good an example of that as any. I don’t wholly blame those publishers for rejecting it though. It’s a disturbing and unsympathetic work richer in ideas than emotion. To be blunt it’s deeply uncommercial. In the afterword to his Gentlemen of the Road Michael Chabon argued that much contemporary literary fiction fell into a genre of late 20th Century naturalism (and that it was essentially genre writing). I have mixed views on that argument. On the one hand it’s easy to see what he’s talking about. On the other while never as popular authors such as Alasdair Gray, Will Self, Haruki Murakami and here Tom McCarthy show that the literary novel and naturalism are not the same thing. So what is Remainder? Plotwise it’s fairly simple. The narrator has suffered a terrible accident. Something fell out of the sky and left him in a coma from which he’s only recently recovered. He has had months of reconstructive surgery and physical therapy. Due to brain damage he’s had to relearn how to control his own body; how to make the simplest movements of lifting a carrot to his mouth or walking. He doesn’t remember the accident itself. In a way that’s a good thing though as the £8.5 million settlement he receives requires as one of its terms that he never discusses it. He can’t discuss it: both legally and practically. Initially this premise felt a little unlikely to me, but acceptably so. Books often ask us to take something of an initial leap of faith with respect to their premises. Anyone who reads science fiction in particular is used to being asked to give the author at least one or two impossible things before breakfast without quibbling too much. What I had yet to realise was that likelihood wasn’t the point. Remainder quickly gets into yet stranger territory. The narrator’s settlement is celebrated by his best friend and a woman he knows and was previously hoping to be romantically involved with. He no longer has any interest in either of them though. In fact he finds them vaguely irritating. It’s soon clear that he’s no longer really the same person as he was before. He’s troubled too by feelings of inauthenticity. Having learned how to do everything nothing feels fluid. He is conscious of everything he does. He reflects that in films people just do things and those things happen; without mess or self-consciousness. When Robert de Niro opens a fridge the fridge just opens. In life when he opens a fridge the fridge sticks or some part of him thinks “here I am, opening a fridge” (that’s not a direct quote). That struck a chord with me. I live myself in a constant state of self-awareness. Sometimes I go to gigs to see a band I love and while I’m jumping up and down I can’t help observing myself jumping up and down being a person at a gig enjoying a band they love. I’m not really there in the moment; I’m there observing myself being in the moment. There’s a remove. The narrator complains to his friend that the accident has left him inauthentic; more artificial than everyone else. Unusual. His friend replies that on the contrary everyone is inauthentic. The narrator isn’t unusual, he’s “more usual than everyone else”. Soon afterwards a chance vision of a crack in a bathroom wall at a party sparks a memory of a time when he wasn’t separate from the world. It was a time when he lived in an apartment and moved through it unconsciously and smoothly. The fridge door didn’t stick. Is it a real memory? Possibly not because he can’t think of a time in his life when he’d have lived in a place like that he remembers, but real or not he decides to recreate it. After all, he has £8.5 million. He can afford to have the whole building recreated together with the view from his apartment window and re-enactors to play the parts of the others he remembers living there. Other re-enactments follow. He takes quotidian events and sees meaning in them and has them re-enacted in painstaking detail in full-scale replicas of the places where these scenes happened. He employs a large and full time staff and a logistical specialist named Naz to ensure that his re-enactments are precisely realised. He moves into his recreated might-be-memory and has his hired neighbours recreate the fragments of life he remembers from his time there. The scale of all this is incredible. The whole exercise is incredible. McCarthy approaches it though in a very naturalistic way. The problems of sourcing the buildings, finding the actors, recreating the remembered surfaces, all these are described and the sheer amount of work required for each re-enactment is clearly detailed. Much of the book is the nuts and bolts of these pointless reconstructions of trivia. There’s a fascination to all this and because McCarthy is a good writer it doesn’t bore. Alongside all this though are more disquieting elements. The narrator feels a sense of euphoria connected with these events as if through them he’s becoming more real. He becomes obsessed with repetition, patterns, systems, communications, and grids. He shows no empathy. He is a monomaniac obsessed with breaking through the shell of awareness that surrounds us all so that experience and action are no longer separate but one. He’s also not trustworthy. He narrates how when in his coma he dreamt of being a commentator at a racetrack. Now he is awake, but is he? Everything suggests he is (it’s possible to interpret the whole book as a dream or as him being dead and in purgatory, but it’s a tedious interpretation) but he is the only source of everything that is described and at one dizzying juncture he admits that a conversation he just described didn’t actually happen. I was so taken aback by that admission I read it twice. I re-enacted it. I felt a sense of vertigo and uncertainty – what the narrator feels through much the book (or claims to feel). Later he’s dogged by a smell of cordite. Nobody else can smell it except for one man, but later still nobody else seems to be able to see that man and this unseen person becomes a meta-narrator commenting to the narrator on the narrator’s own actions. Does the man exist? The narrator can see and hear him and early on it seems at least one other person can, but we can’t trust the narrator and by this point in the book he’s clearly mad anyway. Some books are comforting. Brooklyn was for example. Brooklyn for me was a hugely enjoyable read that I relaxed into. It was beautifully written with a clear and engaging story (if not much plot). This isn’t that kind of book. Remainder is a novel of ideas. It was clear to me quite quickly that to have any chance of understanding some of what it might be about I had to pay attention much more to themes than to events. I’ve talked about some of those themes here: repetition; the barrier of consciousness from direct experience; the intransigency of matter. Another theme is that of cutting away to the truth of a thing. Recently I went to an exhibition in London titled Modern British Sculpture. By chance I got talking to one of the curators of the exhibition; himself also a sculptor. I mentioned that I was reading Remainder and it turned out he’d read it too. That’s not as odd as it might be because sculpture too is a theme here. More precisely the cutting away of stuff until what remains is revealed. Michelangelo spoke of the statue being inside the block of marble already. His job was just to cut away the excess material until the statue revealed itself. The narrator re-enacts experiences but then cuts away at them looking to reveal the remainder that they already contain: the core of the experience or perhaps the act of experiencing. The moment is locked within the stuff, but if the stuff can be bypassed or made to disappear the remainder can be brought into view. It’s not all flawless. Oddly the book worked least well for me when most realistic. McCarthy/the narrator’s description of Brixton as a place filled with young men dealing drugs to each other didn’t mesh with my own experience of living there and the description of Soho as filled with spray tanned gays doesn’t much match my experience of there either (I spend a lot of time in Soho, spray tans aren’t unusually noticeable). Both are cliches of those places rather than their realities. They’re re-enactments of them which don’t persuade. Similarly, part of the re-enactment of the building and old apartment includes the view from it of a sloping tiled roof on which cats would lie in the sun. This part doesn’t work out so well as the cats placed on the roof keep falling off it and dying. For me that rang false because cats in fact very rarely fall off sloping surfaces unless they can’t stay on to begin with and anyway cats aren’t killed by long falls – they’re killed by short ones (I grew up with cats, and in fact had one accidentally fall fifty feet from a tower block window onto concrete. It made a full recovery which I later learned was what I should have expected). It’s ironic though that in this least natural of novels the only parts I balked at were those parts most rooted in reality. I noticed once or twice that many of the characters talked in ways that seemed to me more what I’d expect of a modernist novelist than what the characters were supposed to be, but given the general tone of the novel that wasn’t a problem at all. Other than those rather pedantic caveats it’s also fair to say that the book lost some of its force in the final third and for me went into more conventionally unconventional territory (increased use of violent imagery and images of death which just aren’t as interesting as what’s gone before). The actual ending is very good, as good as it could be really, and there’s still new material of interest but it wasn’t as strong overall as the earlier two-thirds. I said up above that Remainder is disturbing and unsympathetic. It is. It’s a novel that made me work and I’m sure there’s a vast amount in there in terms of symbolism and references that I missed. It’s dense. I’d forgotten about the loyalty-card business. Now I’d been reminded I was really excited by it. I was so close! I gulped my cappuccino down, then strode back to the counter with the card. “Another cappuccino,” I told the girl. “Heyy!” she answered. “Short cap coming up. You have a…” “Of course!” I said. “I was just here!” “Oh yes!” she said. “Sorry! I’m a zombie! Here, let me…” She stamped the tenth cup on my card, then said: “So: you can choose a free drink.” “Cool,” I said. “I’ll have another cappuccino.” “On top of your cap, I mean.” “I know,” I said. “I’ll have another one as well.” She shrugged, turned round and made me a new one. She pulled out a new card, stamped the first cup on it and handed it to me with my two coffees. “Back to the beginning,” I said. “Through the zero.” “Sorry?” she asked. “New card: good,” I told her. “Yes,” she said. She looked kind of depressed. The ideas make this a rewarding read. The wit helps make it a fun one too. It’s never easy but it is remarkably original and it’s no surprise that two books later McCarthy was shortlisted for the Booker (giving hope to rejected authors everywhere). I was persuaded to read Tom McCarthy by Will over at Just William’s Luck. His review of McCarthy’s second novel, Men in Space, is here. While writing this I also found this interesting article about McCarthy which sheds some light on him and on his thoughts about contemporary UK publishing.